Renren beat estimates when it reported results earlier this month. But the stock is still down, largely because of lighter-than-expected guidance. Source: infogr.am, using data supplied by Tencent Holdings; Renren press releases. Comparisons with Facebook are no longer accurate. What's a better comparable? Zynga , which derived 86% of its 2012 revenue from its relationship with Facebook. Renren's gaming operations doubled revenue last year and, as of Q4, now account for 50% of all sales. By contrast, advertising revenue fell 16.7% in the fourth quarter and 10% for the year. 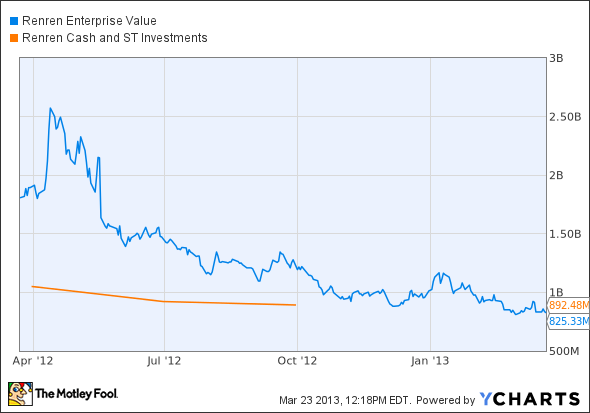 RENN Enterprise Value data by YCharts. By the looks of it, investors have given up hope that Renren will grow from here. All but $240 million, or 22%, of the company's U.S. market value is denominated and cash and short-term investments. Any meaningful gain in profits from mobile and gaming could send this stock soaring. Would you buy Renren at current prices? Would you short? Let us know what you think in the comments box below. If you'd like to know more about Renren and the rise of social media in China, The Motley Fool has published a premium report on Renren to give you a rundown of its opportunities and threats. Just click here to get started. The article 1 Reason to Hate Renren, and Why It Might Be Misguided originally appeared on Fool.com. Fool contributor Tim Beyers is a member of the Motley Fool Rule Breakers stock-picking team and the Motley Fool Supernova Odyssey I mission. He didn't own shares in any of the companies mentioned in this article at the time of publication. Check out Tim's web home and portfolio holdings or connect with him on Google+, Tumblr, or Twitter, where he goes by @milehighfool. You can also get his insights delivered directly to your RSS reader.The Motley Fool recommends and owns shares of Facebook. Try any of our Foolish newsletter services free for 30 days. We Fools don't all hold the same opinions, but we all believe that considering a diverse range of insights makes us better investors. The Motley Fool has a disclosure policy.